We invite you to explore India - the Land with infinite beauty ! Whether you soar high into Himalayas or peer under the ruins of the Ancient monuments dotting the landscape of India, you will cherish the experience long after your visit ! 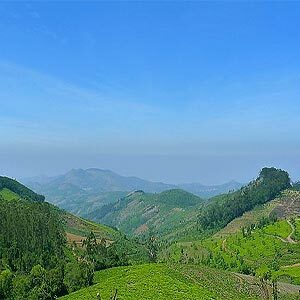 This India Travel Guide on Kudremukh is free from any commercial interest! This site is dedicated to promote India - the vast subcontinent, its glorious past, magnificent landscape and its infinite variety. Kudremukh means the 'face of the horse' in Kannada. The shape of the highest mountain peak here resembles the face of the horse. This place is rich in iron deposits and Government of Karnataka has set up a world famous KIOCL (Kudremukh Iron Ore Company Limited) to carry out mining operations. Kudremukh national park is the major attraction of this region housing amazing variety of wild animals and close to 200 species of birds including varieties like hornbill, whistling thrush, Malabar trogon. This National Park is covered with thick tropical forests and plenty of rivers and streams. The park stretches over 600kms and has been declared as a protected site in 1987 and has recently been designated as tiger reserve. Other wild animals include leopard, wild dog, jackal, lion-tailed macaque, common langur, sloth bear, gaur, sambar, spotted deer, barking deer, Malabar giant squirrel, giant flying squirrel, porcupine and the mongoose. The park has about 13 trekking routes intertwined with each other and trekking here offers a wonderful experience with rich scenic beauty and greenery all over. Kudremukh peak located inside the park is the highest point in Kudremukh region and it measures as high as 1894 m above the sea level. This peak offers a spectacular view of the mountains and deep valleys. Kadambi water falls is another interesting spot located inside the park. Hanuman Gundi waterfalls is one of the major attractions of Kudremukh park where the water gushes down the rocks from a height of 22mts. Gangamoola, a high mountain also known as Varahaparvatha is a source of three holy rivers Netravati, Tunga and Bhadra. Gangamoola hill dots the national park region and rises 1458 m above the sea level. The major attraction of this place is a cave which houses a temple with huge image of Varaha and a shrine of Goddess Bhagawati. However this place is closed during monsoon. Lakya Dam: Lakya Dam was originally built to discard the red sludge that comes out during mining operations but it has subsequently become a tourist spot due to its unique and distinct look. Visitors have been asked to maintain a safe distance as this waste may be of toxic nature. Jamalabad Fort: Jamalabad fort, built in the year 1794 by Tipu Sultan, a ruler of Mysore stands as a testimony to the glorious past. It is a beautiful granite fort and is named after Tipu Sultan’s mother Jamalbee. It rains heavily here between June to September. Apart from these months, weather is quite pleasant during the rest of the year. November to march is an ideal time to visit Kudremukh. There are not many hotels within Kudremukh area, but if you are adventurous and want to enjoy nature from close quarters, forest department arranges for campsites and tents within the national park. They also arrange for food and outdoor activities. There is a small town called Kalasa, about 20kms from Kudremukh where you can find accommodation. Silent valley resort (luxury hotel) Chandan hotel, Naveen lodge, Seethanadi nature camp are popular amongst tourists, to name a few. Whether you take air route or rail route, nearest destination is Mangalore. From here Kudremukh is well connected by road and one can opt for a private bus service or buses operated by Karnataka government (KSRTS) or hire a cab to reach to Kudremukh.